As I’ve talked about before Red Lobster is one of my favorite places to go eat. Why? One reason, and one reason only…. Their amazing biscuits!!! How can you not love those cheese, hot, heavenly biscuits! 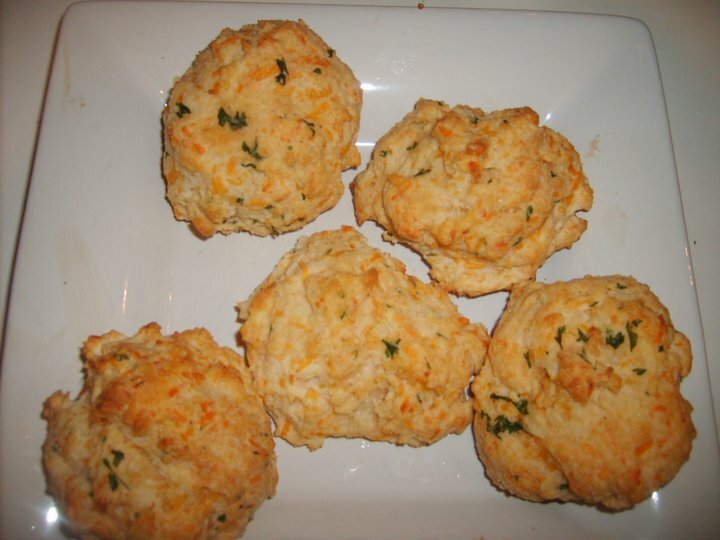 Although I love their biscuits, my pocket book would not be able to handle the hit(s) every time I am craving them so I came up with my own version to make at home. I know I am biased but these taste just as good as Red Lobster’s! Preheat the oven to 375 degrees, and lightly spray a baking sheet with baking spray. In a large mixing bowl add the baking mix, cheese, water and half of the garlic powder, salt, onion powder, and dried parsley. Mix until the dough is firm and sticky (adding more water 1 tsp. at a time, if needed). Using your hands, form the dough into 10 equal size biscuits and place the biscuits on the prepared pan. Bake the biscuits at 375 for 10-12 minutes or until golden brown. While the biscuits are baking in a small microwave safe bowl add the melted butter and the remaining garlic powder, salt, onion powder and parsley. Brush the butter mixture over the baked biscuits immediately once you remove them from the oven.